Today Razer launched the all-new Razer Blade 15. The headline claim is that this is the "world's smallest 15.6-inch gaming laptop." 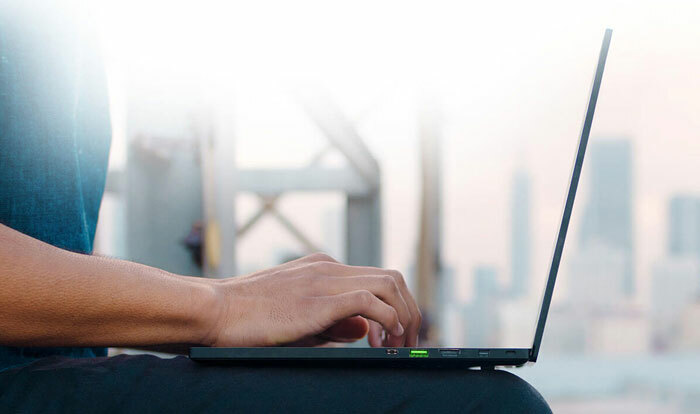 Even though it is compact and light, Razer still packs in some potent components such as; up to a 144Hz refresh rate 15.6-inch Full HD display with 4.9mm thin bezels (4K 100% Adobe RGB screen optional), an 8th Gen Intel Core i7-8750H, up to an Nvidia GeForce GTX 1070 Max-Q GPU, up to 32GB of 2667MHz dual-channel RAM, and up to 2TB of SSD storage. 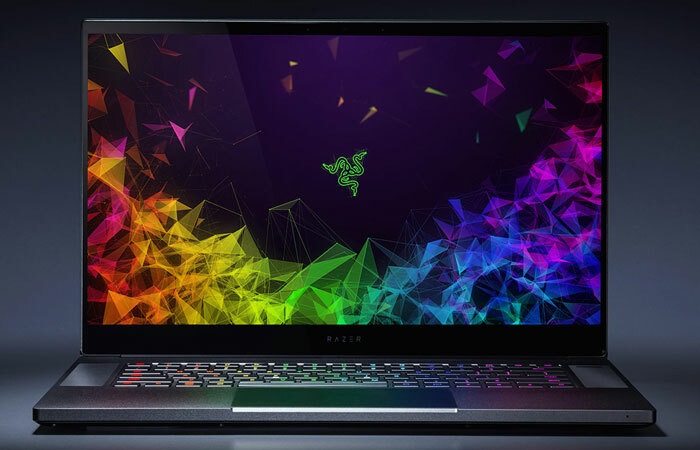 "We are proud to have again stepped-up as an industry leader, taking laptop engineering to the next level to give gamers the performance they require and the mobility they desire," said Razer Co-Founder and CEO Min-Liang Tan. "We upgraded to Intel’s latest 6 core processor, used a fast 144Hz display driven by NVIDIA GeForce GTX 10 Series graphics, and set a new standard for power in the world’s smallest 15-inch gaming laptop." As it is a headline claim, let us first look at the size and related physical qualities of the new Razer Blade 15. The machine measures 355 x 235 x 16.8mm and weighs in at 2.1kg ±0.05kg depending upon configuration. Razer says the chassis is CNC milled from a single aluminium block and given a scratch resistant anodized black finish. Helping make the laptop so compact for a 15.6-inch model is the minimal bezel of 4.9mm to the sides. There are three screen choices; FHD IPS at 60Hz, FHD IPS at 144Hz, and 4K IPS with multi-touch at 60Hz. All panels are calibrated at the factory and offer 100% sRGB reproduction. When making a compact computer system thermals can be challenging but Razer says it uses a number of technologies to minimise thermal issues. Vapour chamber technology is used rather than traditional heatpipes, to cool the CPU and GPU. 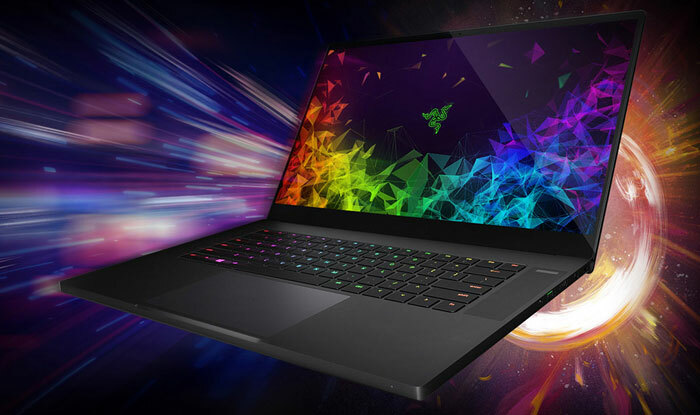 Elsewhere "ultra-thin nanoparticle material and graphite-based server grade thermal interfaces reduce hot spots and facilitate heat transfer," says Razer. High-performance low-noise fans push air across dual heat exchanges with 0.1mm thin fins to move warm air out of the back of the chassis. Processing power is provided by the new 8th Gen Intel Core i7-8750H (6C/12T with base 2.2GHz and boost of 4.1GHz) plus a choice between an Nvidia GeForce GTX 1060 (6GB) or GeForce GTX 1070 (8GB) graphics card, featuring Max-Q. Razer includes 16GB of 2667MHz dual-channel system memory and fast PCIe SSD storage with configurations up to 512GB, with support for up to 32GB of memory and up to 2 TB of storage. For input, Razer has equipped a precision glass touchpad and anti-ghosting keyboard with Razer Chroma backlighting. Ports and connectivity includes; Intel Wireless-AC 9260 (IEEE 802.11a/b/g/n/ac, and Bluetooth 5, Thunderbolt 3 (USB-C), USB 3.1 port x3 (SuperSpeed), Mini DisplayPort 1.4, HDMI 2.0 audio and video output. An 80Wh Li-Po battery is installed. As you can see in the screen grab above, only the Razer Blade 15 with 144Hz FHD screen and GTX ,1070 is available right now, the other models should ship next month. In other news from Razer today, it has launched the Razer Core X external graphics enclosure. 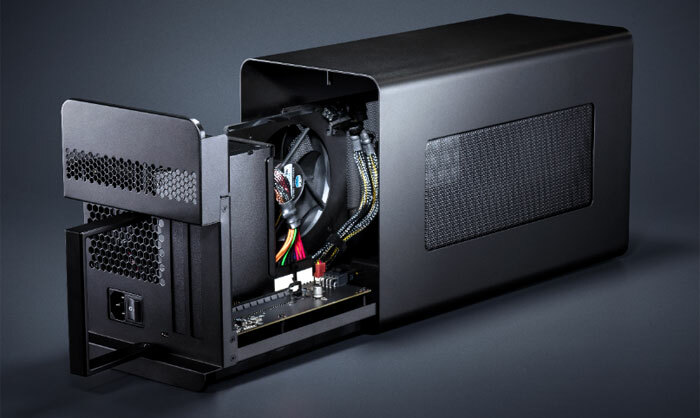 This is a bigger brother for the Razer Core V2 which features an expanded internal design with a wider aluminium shell to accommodate up to 3-slot wide desktop graphics cards. It uses a standard Thunderbolt 3 connection and can be used by, not just Razer blade laptops but all modern Windows 10 and Mac computers with the appropriate connectivity. The Razer Core X packs a 650W ATX power supply to provide adequate power for the latest and future graphics cards. Its TB3 connector can provide 100W of power for laptop charging. The Razer Core X is what they needed. $299 price point saves it. Interested in the Blade as well - the graphite thermal interfaces are in vogue, and the vapor chamber will be interesting. The Core X is at a more reasonable price point, but I think it will lose a lot of favour due to its size, the thing is absolutely massive compared to alternatives. I would say a lot of people who are interested in these external enclosures also want them to be somewhat portable.